In Dimension W episode 7, called The Voice Calling from the Past, Salva-Enna-Tibesti kicks off the Easter Island hunt. We find out about Kyōma Mabuchi’s girlfriend and why she’s not around anymore. Plus: where’s Lwai? Warning: As usual, this review contains spoilers. Please watch the episode first! Then we can have a discussion and you won’t have to live through a spoiler. No one wants that! Interested in Dimension W merchandise? Amazon has a good selection. Here’re four; if you don’t see one you like, search for more! Mabuchi could hardly believe his luck finding such an intelligent, sensitive, and beautiful girlfriend. This being anime, though… Capture from the Funimation stream. Mabuchi got into a lot of fights in high school. On the way home in the rain, he came upon Miyabi Azumaya, a girl who had fallen between a wall and a bus. He saved her and was surprised that she wasn’t afraid of him. Things went swimmingly until she stumbled for no apparent reason and they found out she had a degenerative and incurable disease. Mabuchi being Mabuchi wouldn’t accept that fate, so he visited all of the prosthetics doctors looking for someone who could replace Azumaya’s body. Of course, he couldn’t just ask — he had to pick them up and swing them around a bit. He learned that only one doctor, Seira Yurizaki, was even trying to replace the whole body. He tried to introduce himself to her — by tossing her body guards around — until Colin Keys, Dr. Yurizaki’s personal guard, stopped him. Despite being pinned, Mabuchi was still able to beg the doctor to help his girlfriend. Colin, in an astounding coincidence, was recruiting for a super human unit called Grendel, created by Shido Yurizaki (the founder of New Tesla Energy, deceased since episode 1). If Mabuchi joins, Colin will pull some strings and ask Dr. Yurizaki to include Azumaya as a test subject. Of course, he agrees. He marries Azumaya and goes on his first mission. Mabuchi led the attack on Easter Island at about the same time Dr. Yurizaki began operating on Azumaya. The assault seemed to go well until it didn’t. 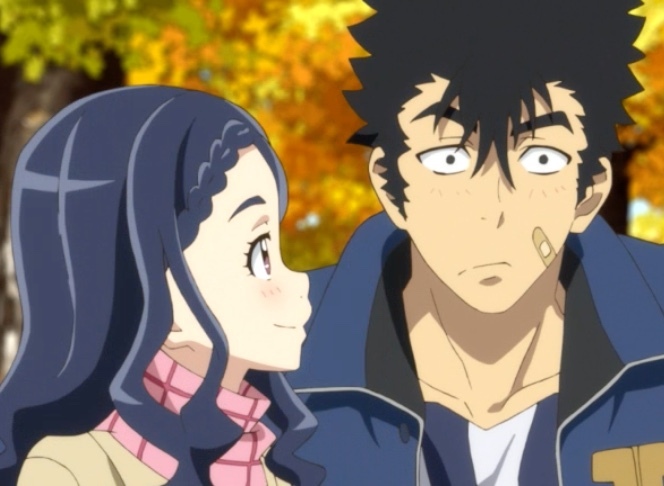 Mabuchi woke up in a hospital to find an injured Dr. Yurizaki and weeping Tsubaki Azumaya, Miyabi’s sister. A coil blew up during the operation and decapitated Miyabi. In the present, Mabuchi asks Mira Yurizaki to come with him to Easter Island. They take a new sports car to the airport, where Albert Schumann piloted a military transport to take them and the car to the island. Uh oh! Looks like Easter Island’s not dead after all! Capture from the Funimation stream. Meanwhile, Salva-Enna-Tibesti tells the New Tesla Energy ruling council that the reason he picked Easter Island for his little show was that even though it had been a dead zone for coils since the Grendel accident, a satellite had recently recorded a bit of Dimension W energy in the shape of a person. He wants to sent the Collectors to Easter Island to retrieve whatever coil was there generating the ghostly figure. As Mabuchi, Mira, and Albert flew to Easter Island by themselves, other Collectors like Loser and Elizabeth Greenhough Smith were flying to the same place with Salva-Enna-Tibesti. A ball of energy and various weather phenomena attacked Salva-Enna-Tibesti’s airship and knocked it out of the sky just as it reached the island. The men in the Grendel unit looked as tough and anti-social as Mabuchi. But they asked about his wife’s operation and seemed genuinely concerned for him. I appreciated that camaraderie! I continue to enjoy the quality of the animation. It’s colorful, the action is smooth, and the characters are distinct and believable. 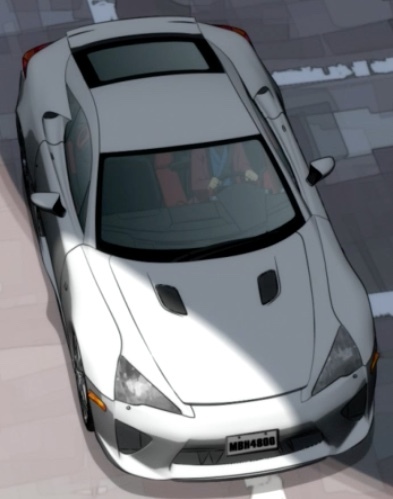 Mira jumped into the wrong car — she had no idea Mabuchi had a different car for this trip. She wasn’t in the episode very much, but I find her delightful. I wish she were in more scenes. Loser gave us a decent description of Dimension W: each moment in our world contains infinite possibilities, only one of which is realized. The ones that are not realized fall into Dimension W as energy. I like that: simple and to the point. Faster than a cheetah. More nimble than a gazelle. Ground clearance of a snake. Capture from the Funimation stream. Azumaya was kind, sweet, and soft-spoken. She had a quirky good luck charm (an old camera) and an attractive and attentive older sister. Pretty much everything you’d expect from an “about to die” girlfriend! Maybe I’m just getting old*, but I was hoping his girlfriend would have been, I don’t know, unique in some way. She felt too idealized — kinda like Hwi from God Emperor of Dune. Now, if it turns out the Ixians and the Bene Tleilax conspired with New Tesla Energy — I’d take back everything unflattering that I just said! That would be awesome! Why take a sports car to a devastated island? Wouldn’t an SUV or military vehicle be better? I know Mabuchi planned to avoid most of the dimensional wreckage, but no one’s maintained the roads for years. In a sports car ten centimeters off the ground a pebble or even a turtle would ruin his plans! Why take Mira to an island that dampens coils, when she’s powered by a coil? Does he think a Mira statue would be good luck? Where was Lwai? He was a major character last week. 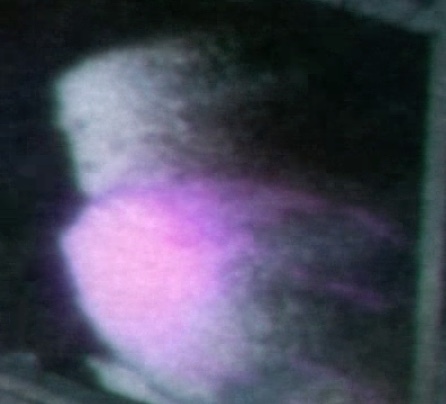 The last episode made a big deal that his body was the same as Mira’s. Where was he in this episode? He was too dynamic a character to just dump! * Okay, yeah, I am getting old — maybe I should have said I’ve gotten jaded after watching so much anime and science fiction over the years! More Mira would go a long way to helping me like the show better. Capture from the Funimation stream. 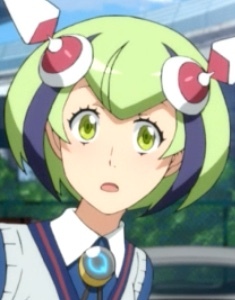 I really want to like Dimension W. The individual elements are all there. Mira is adorable and sympathetic. Mabuchi is a strong male lead with a haunted past and tortured emotions. New Tesla Energy is a compelling mystery: good guys or bad guys? Saviors or destroyers? Even the supporting cast like Loser and Elizabeth showed moments of dramatic potential. Yet, considered as a whole, I still feel disappointed. Why show Miyabi and Mabuchi’s back story in such detail? The plot had already given me everything I needed to know: he loved her, the coils killed her, and he’s still tortured. I would rather seen the episode using the time to develop the partnership between Mira and Mabuchi. Or show Mabuchi sparring with Loser. Or Mira talking to Tsubaki to learn more about Mabuchi. Or something! Here we are at episode 7, and I feel like Dimension W has started a lot of interesting plot threads only to leave them dangling. Well — and this is the anime optimist in me — maybe next week’ll be different!